FOR 10 1/2-12 1/2 FT HAMMOCKS - Prolonged weight on the hammock or long-term use will make the hammock stretch. For example, the 10 ft hammock will be stretched to 12ft with heavy weight on the hammock or long-term use. If the hammock has been stretched over 12 1/2 ft, then it may no longer fit the hammock stand. 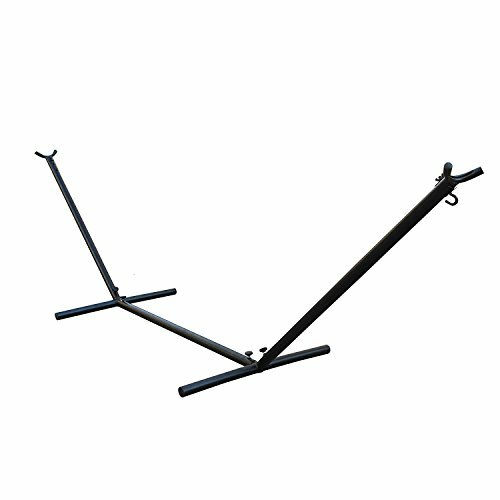 BLISSUN Hammock Stand is constructed of durable steel, a weather resistant black powder coated guarantees durability and safety. It can be assembled without anyone’s help! Its portable and space saving design allows you to set up anywhere!